Last year my husband Dave won a prize when he entered a draw for retired Manitoba teachers who were doing volunteer work. 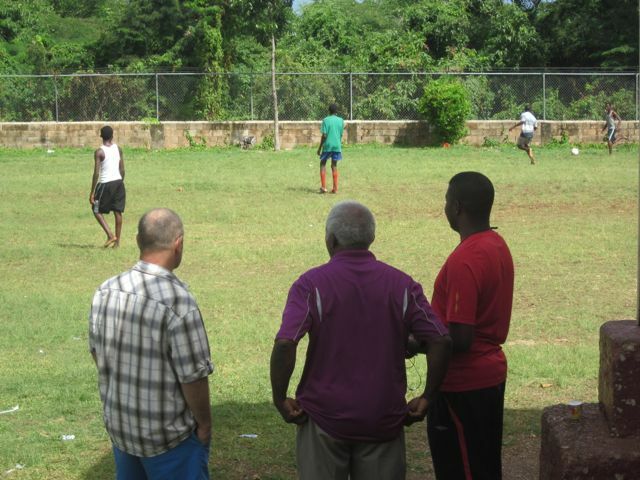 He mentioned the volunteer work we had done in Jamaica. The news article about him winning his prize was in a 2014 KIT magazine. Later a staff person contacted me to ask if I would write a story about our volunteer experience. It was just published in the Winter 2015 issue of the magazine. The fact that so many people at church, at my part time jobs, at social functions and via e-mail and phone have talked to me about the piece lets me know retired teachers really do like to KEEP IN TOUCH. It just proves that the name of the magazine KIT (Keep in Touch) is exactly what the magazine does- keeps retired Manitoba teachers in touch with each other. 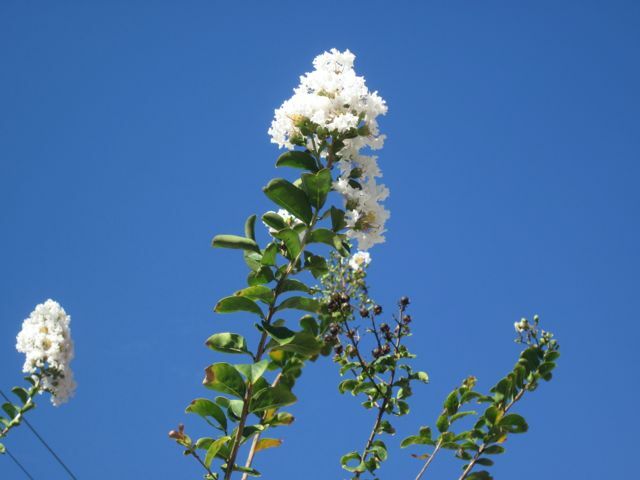 Karaoke, goats, Bingo, more flowers and farewells. 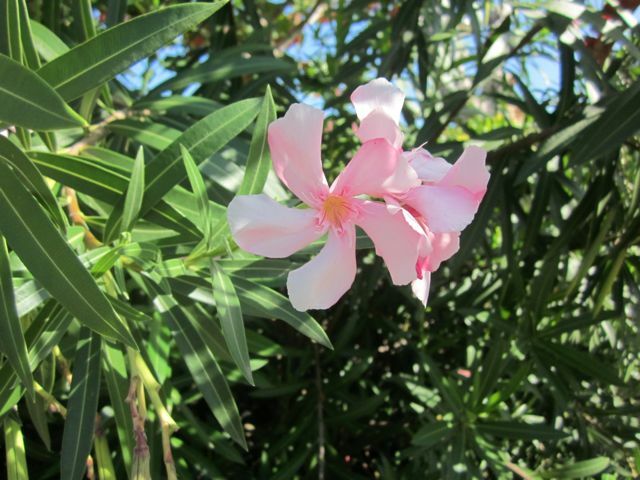 We’ve left Jamaica for other adventures but there are interesting bits and pieces of our time there that I want to keep a record of and they just didn’t fit into any other blog post. Here they are! 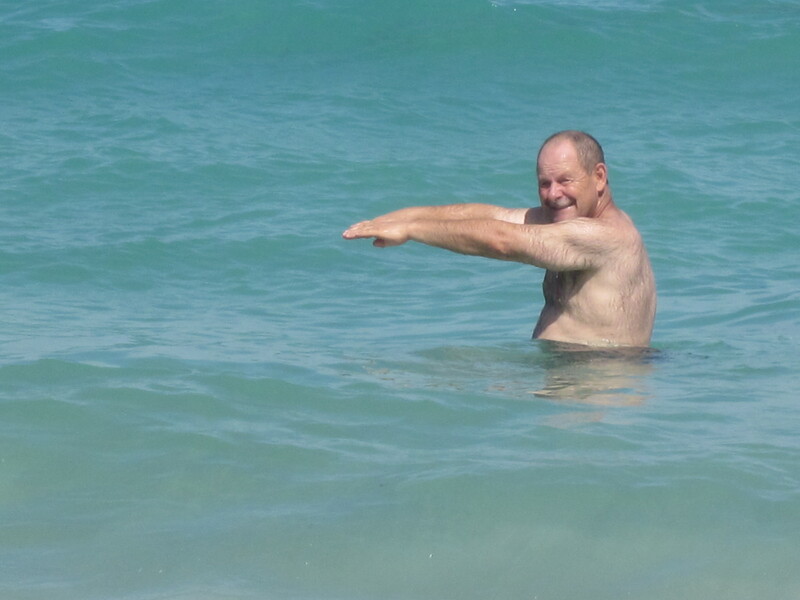 I’ll start with a photo of Dave swimming in the ocean. Most evenings Dave and I cooked supper at our bed and breakfast or went out to small local places where we could get supper for around $5. 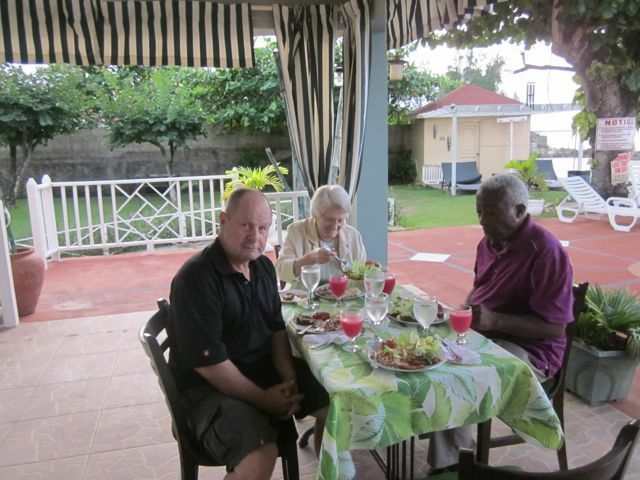 Our first Sunday in Jamaica however we splurged and went out for an elegant dinner at the Piper’s Cove Villa. 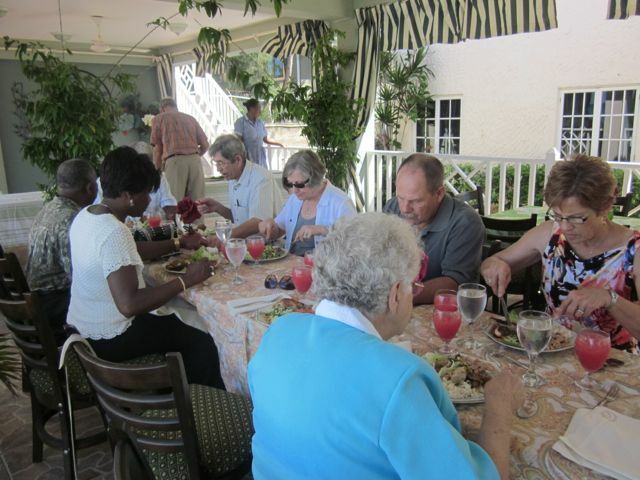 We went back our last Sunday in Jamaica along with our hosts the Beaches and the other three couples who had joined us at the Morning Glory Bed and Breakfast. 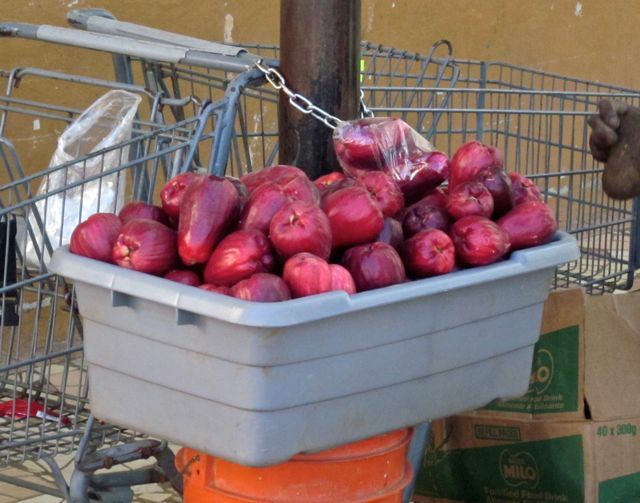 I did a post about some Jamaican foods we tried but here’s others we’ve tried since. Cornmeal cereal with condensed milk and cinnamon, sorel juice, custard apple, Jamaican apple, potato pudding, naseberry fruit and June plum. One night we went singing karaoke at a local bar. 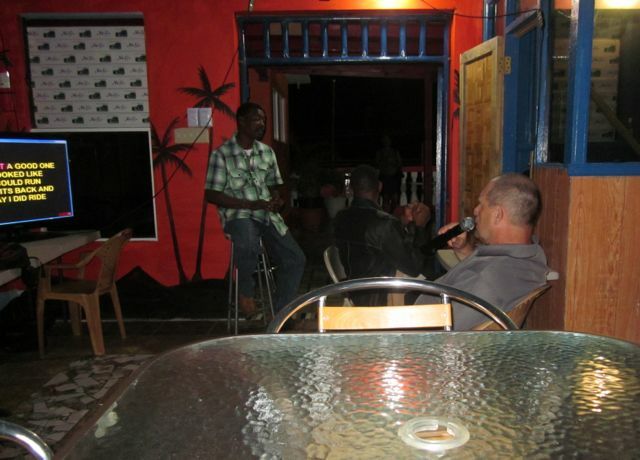 Some of our Jamaican neighbours were great performers. Dave tried his hand at a little Johnny Cash and was a hit. 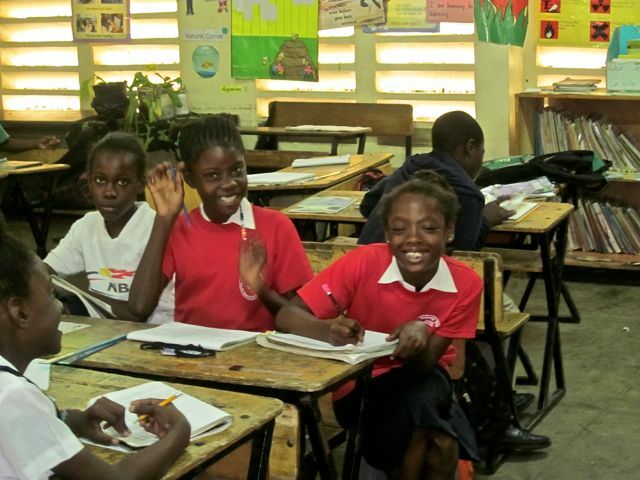 On Fridays the regular volunteers don’t come to the Resource Centre where we were tutoring. Dave and I asked directors Mildred and Tony Beach if we could plan a couple of Fun Fridays for the kids and they agreed. We taught them action songs, played board games, took them out for soccer and played games like Scattergories and Pictionary with them. 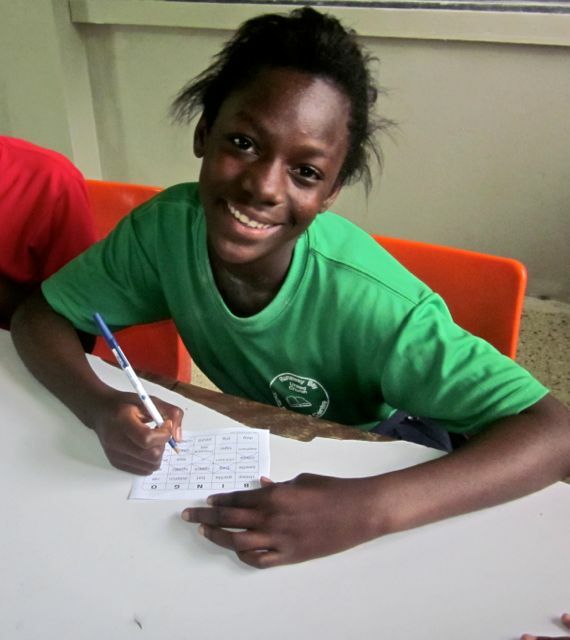 Their very favorite activity however was playing Bingo. 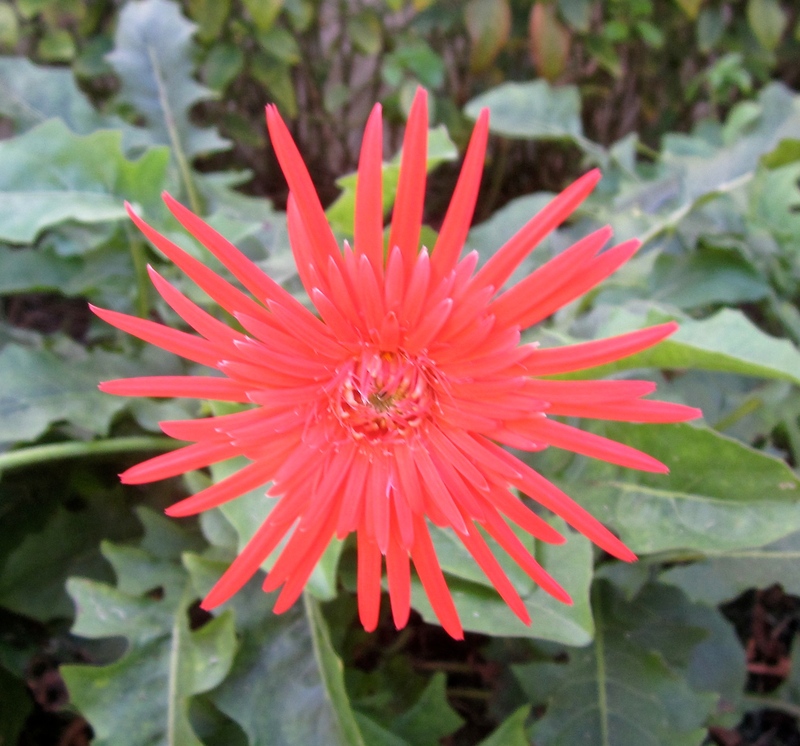 I have already done a blog post about flowers but here a couple more photos that I’ve taken since. 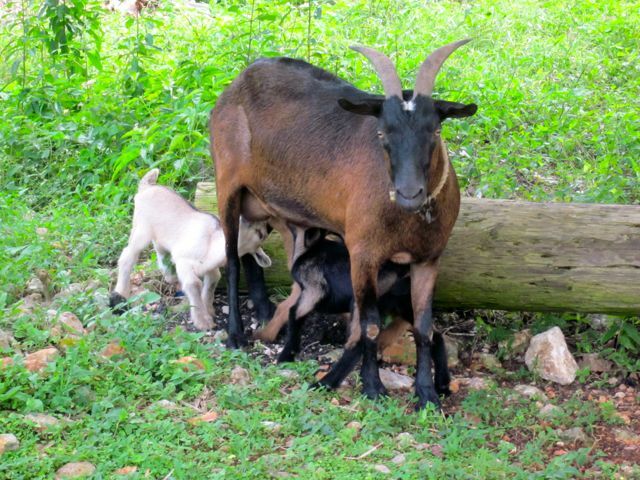 My most lasting memory of Jamaica will be of goats. They are simply everywhere much like cows are in India. I have so many photos of goats. 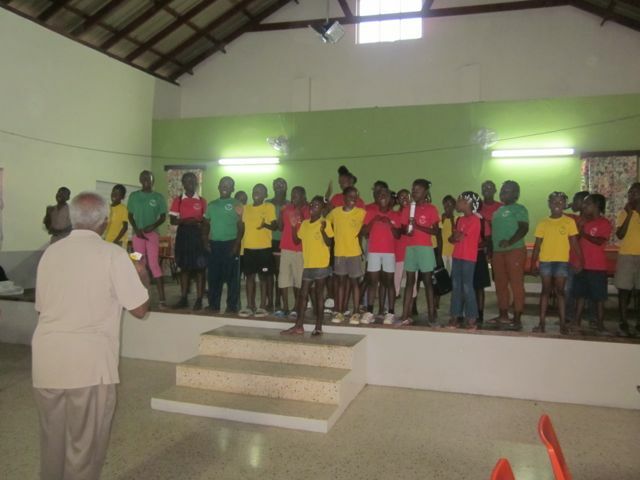 Our last day at working at the Resource Centre the children sang a special farewell song for us. And then we were inundated with hugs and final requests to take photos of our kids. Their families don’t have cameras and they loved it when we took photos of them. 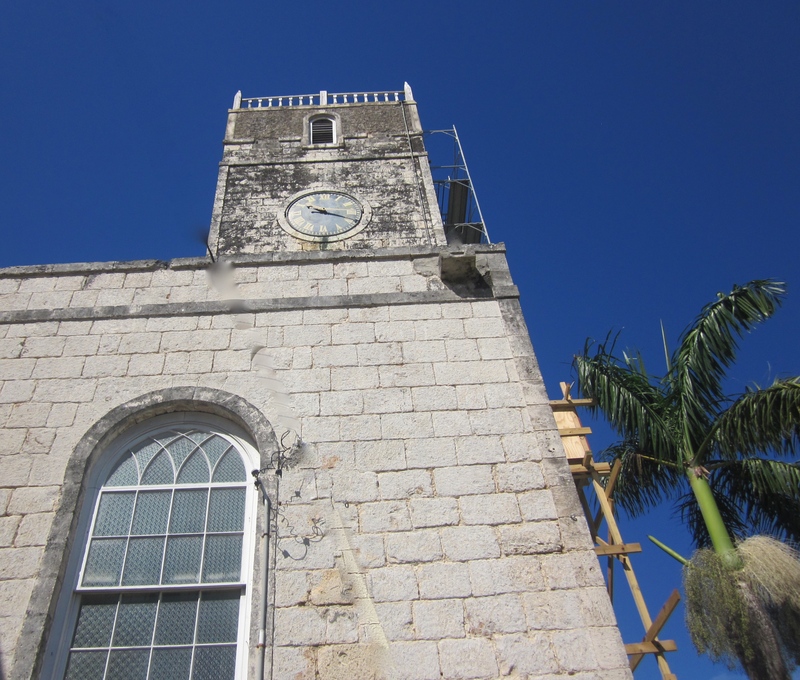 St. Peter’s Anglican Church in Falmouth Jamaica is a beautiful edifice but the legacy of the people who built it and first attended it is anything but beautiful. We went to Falmouth one day and spent some time wending our way through St. Peter’s Anglican Church built in 1796. A friendly woman welcomed us. 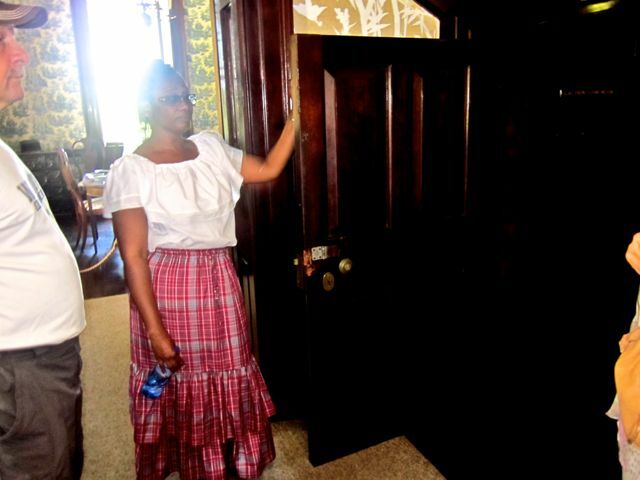 She says she volunteers six days a week showing visitors around her historic church. I wonder if she knows the history of some of her church’s founders? 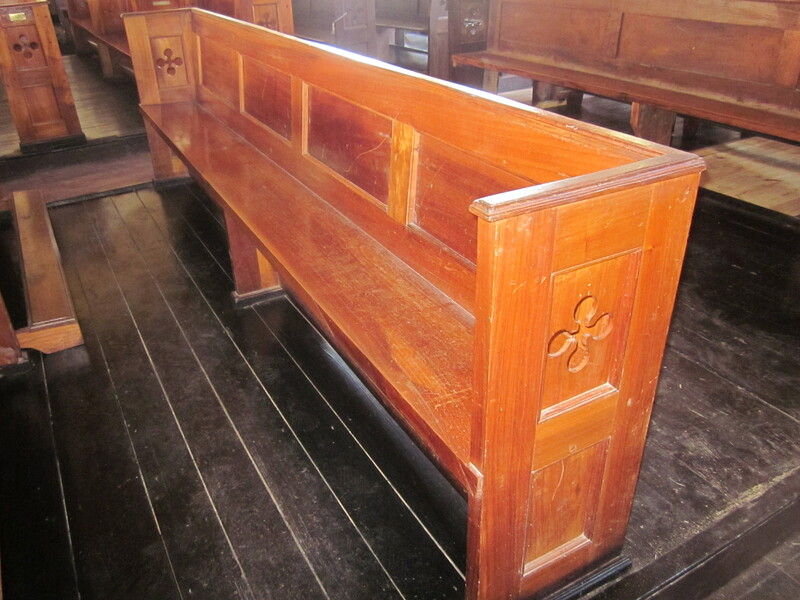 The pews in the church are originals over 300 years old. 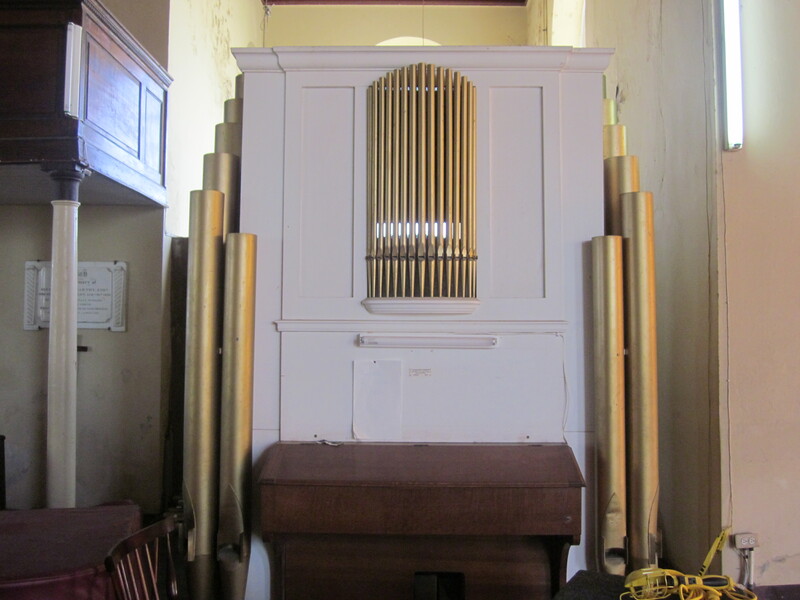 A Jamaican plantation owner donated the money for the pipe organ. It has been taken apart because the church is currently being renovated. 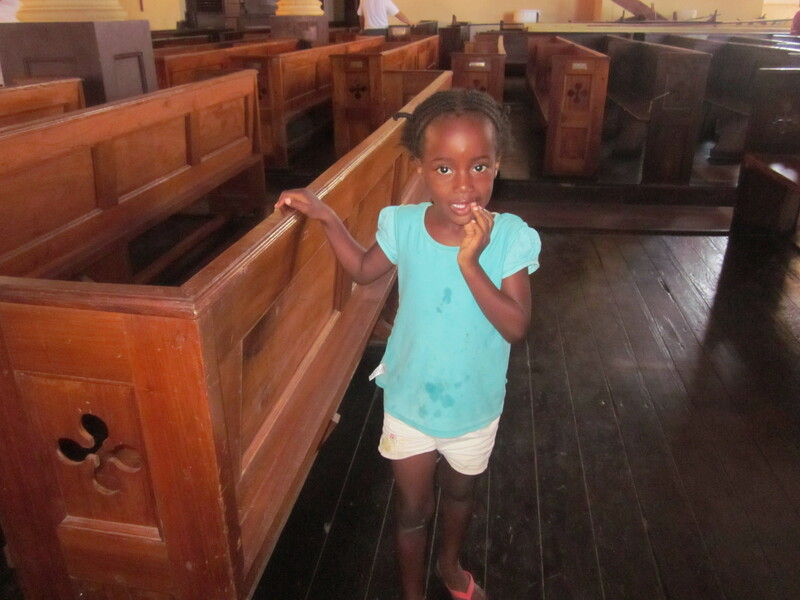 This little girl was running around in the church possibly the daughter of one of the workers doing renovations. 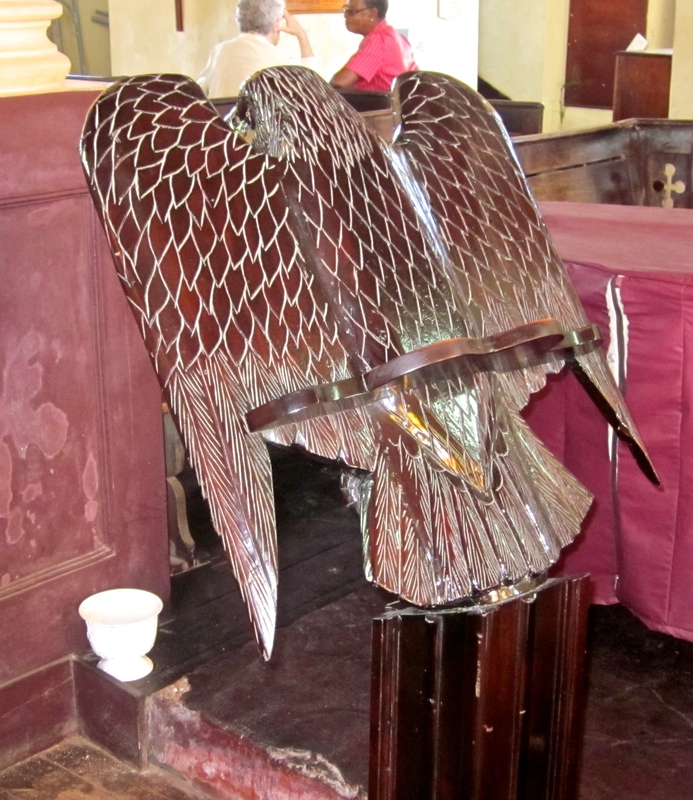 The pulpit is shaped like an eagle in flight with intricate carvings on the wings. Many of the gravestones in the church cemetery are over 200 years old. 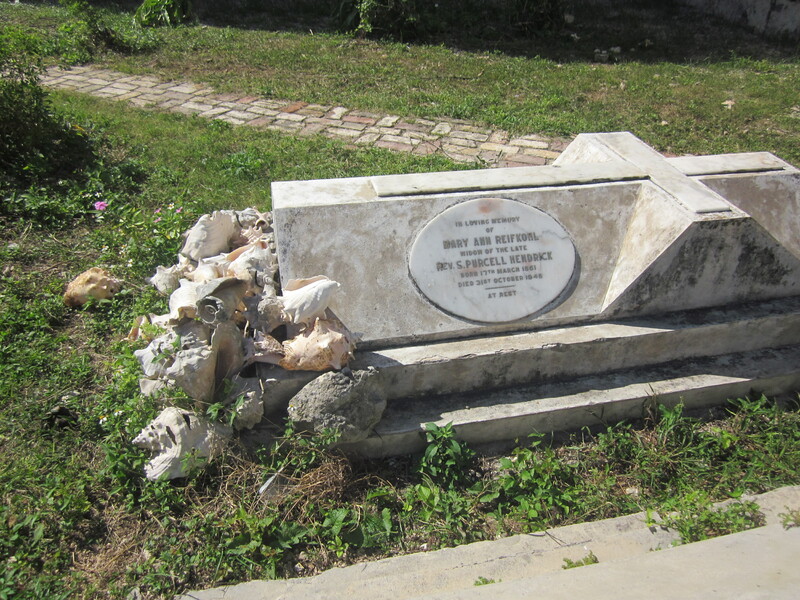 Some graves were decorated with seashells. Apparently this is a custom practiced in places in the world where African slaves were sent. They said the sea had brought them to their new country and the sea would return them to Africa when they died. 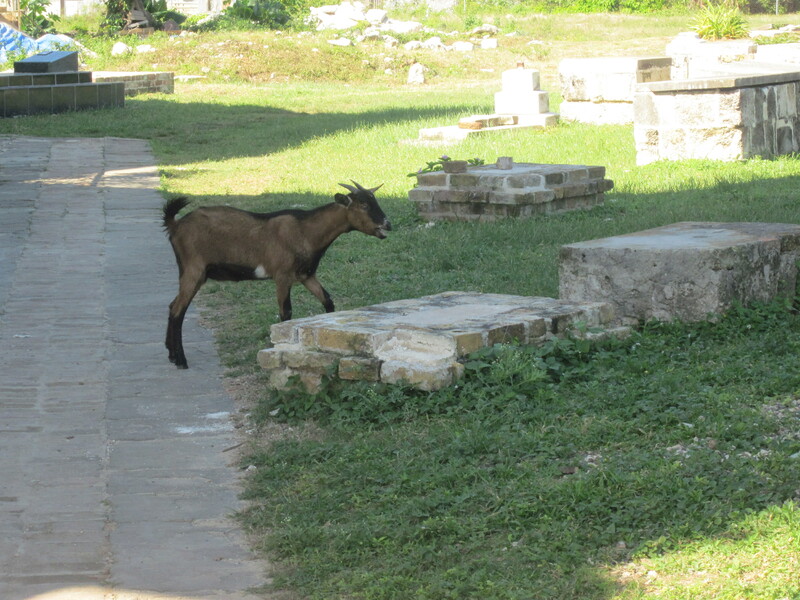 “The sea brought us- the sea shall take us back.” There are goats everywhere in Jamaica including the church graveyard. I was intrigued by the language used on the memorial plaques in the church. 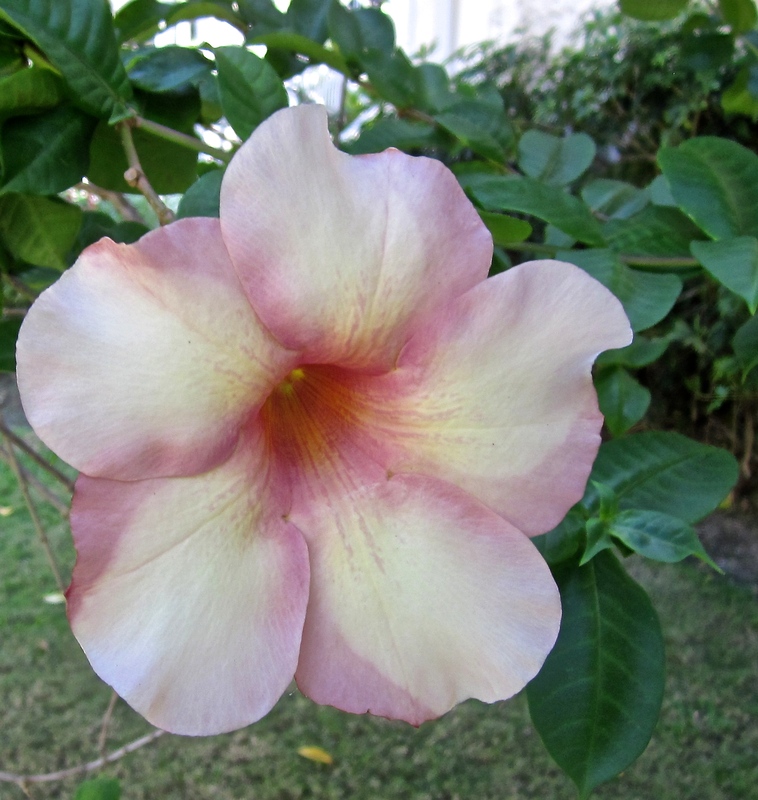 This is one example for Samuel Earnshaw owner of the Colchis plantation. After reading his noble tribute I was shocked to learn the truth about Mr. Earnshaw. A man of unassuming manner and unimpeachable integrity who from a spirit delighting in acts of generosity and benevolence, distributed the blessings of life bestowed upon him by the Divine Power with a cheerful and liberal hand. 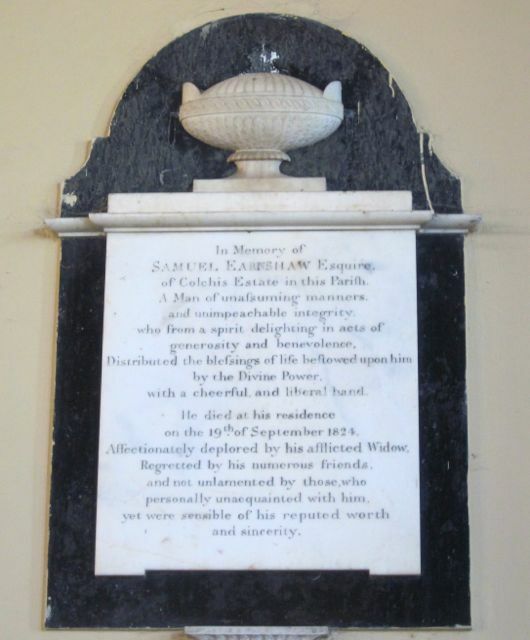 He died the 19th of September 1824. Affectionately deplored by his afflicted widow, regretted by his numerous friends, and not unlamented by those who personally unacquainted with him yet were sensible of his reputed worth and sincerity. Checking the 1824 Jamaica Almanac I discovered the generous and benevolent Mr. Earnshaw was also the owner of over 350 slaves and the afflicted widow who so affectionately deplored him is featured in an anti-slavery pamphlet printed in 1830. 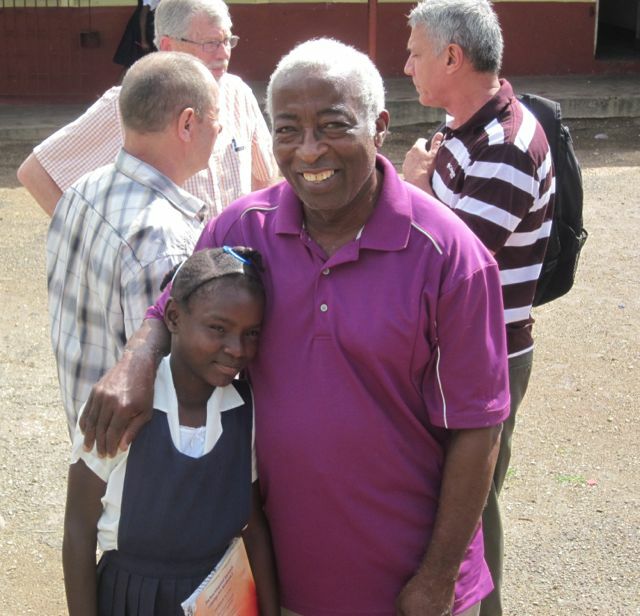 A report concerning……..A mulatto female slave, Eleanor Mead of Colchis estate in Jamaica. Her owner Mrs Earnshaw, for some offence, ordered her to be stripped naked, held prostrate on the ground and given 58 lashes of the whip. 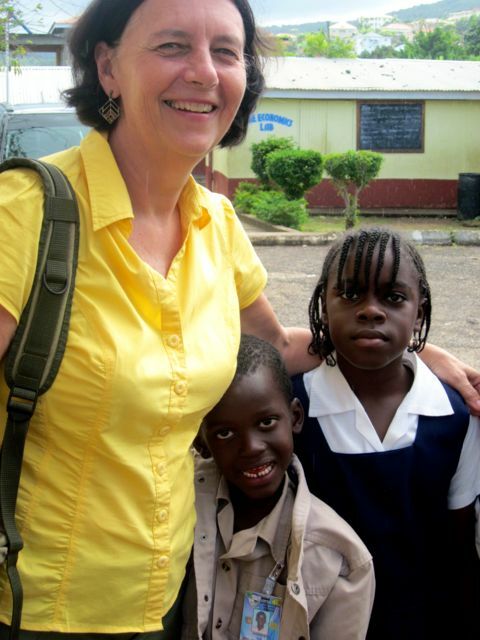 One of the people ordered to hold her down was one of her own children. She was then , still semi naked, put in the stocks with her feet fastened. All this was at the order of and in the presence of Mrs Earnshaw ‘a lady of humanity and delicacy’. And the plot thickens. Reading an excerpt from a book called The State and Law of Manners in Jamaica I discovered that abolitionist supporters took the case of Eleanor Mead’s harsh punishment to court and during the trial it was brought to light that the before his death Mr. Samuel Earnshaw man of unimpeachable integrity had taken his slave Eleanor as a lover and Mrs. Earnshaw inflicted her unreasonable punishment on Eleanor because she was jealous of her deceased husband’s affections for the woman. During the court case testimony showed that Mrs. Earnshaw had tried to punish Eleanor in the past but her husband had always intervened. Now that he was dead she was not to be stopped! What next? I’d love to research some of the other memorial plaques I photographed in the church and find out more about the people being lauded and praised for their virtues. 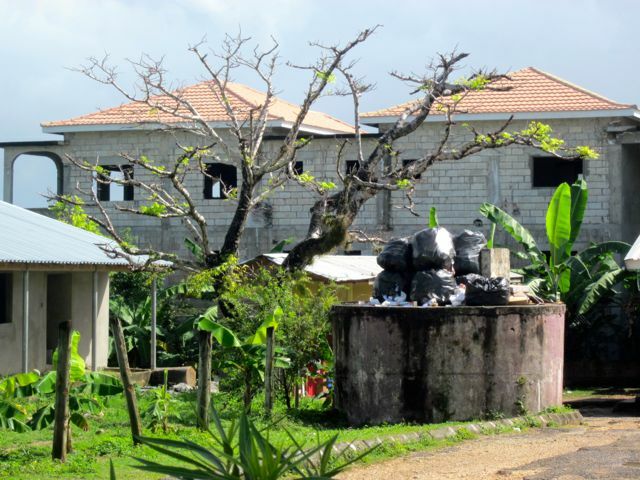 Other posts about slavery in Jamaica…….. 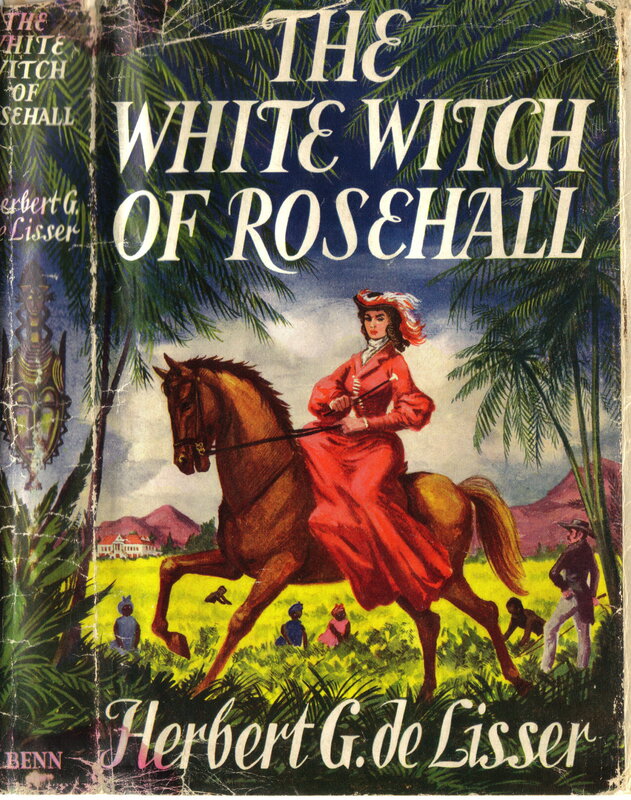 I didn’t sleep well last night and I think it’s because I was remembering scenes from the book The White Witch of Rose Hall by H. G. DeLisser written in 1929. I started reading it yesterday after we had visited a haunted plantation house near Montego Bay Jamaica. 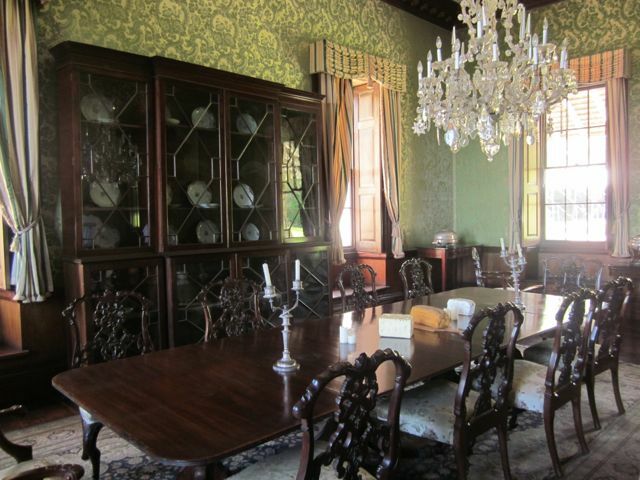 I’ve been wanting to see a ‘great house’ – a home of former plantation owners. 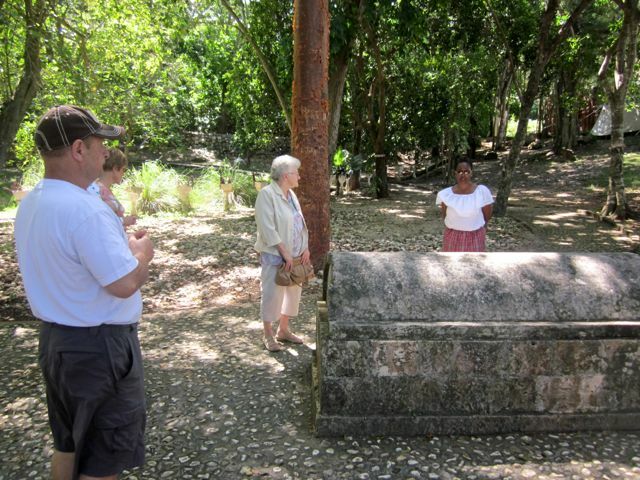 Many were burned during the slave uprisings in Jamaica but a dozen or more remain on the island. 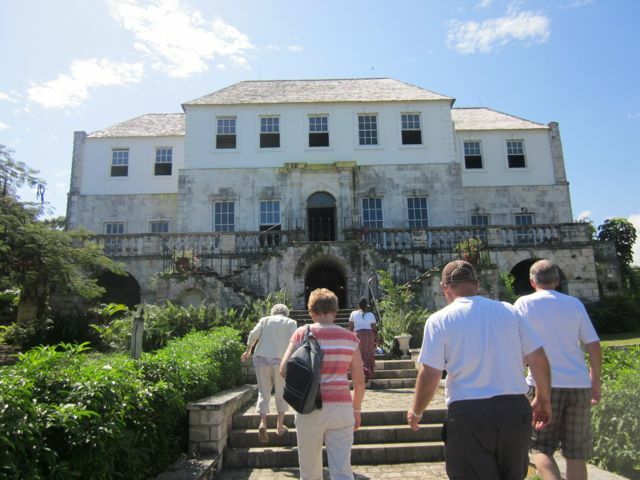 One of them Rose Hall was the great house for a 6000 acre sugar cane plantation with 2000 slaves. It was in quite a state of disrepair when it was bought in the 1960’s by a former Miss USA named Michelle Rollins and her husband John. 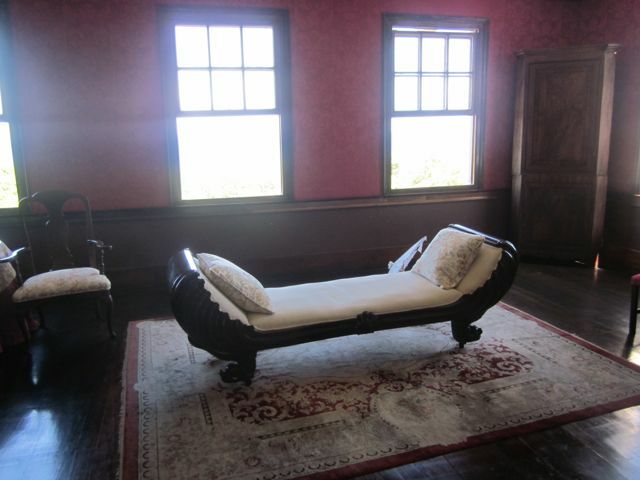 They restored it to its original condition and began giving tours. 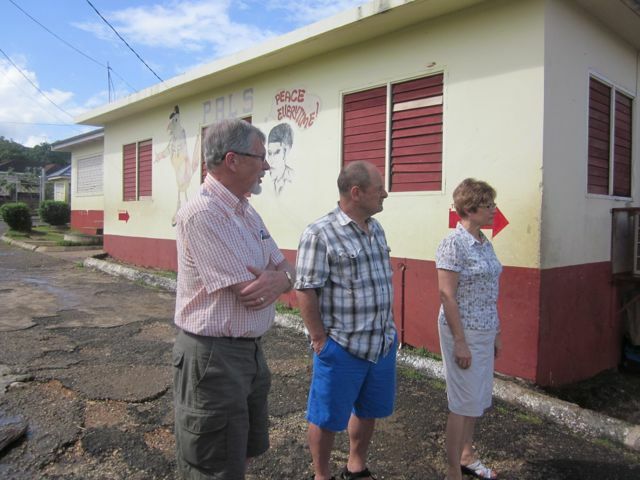 Although by now the place obviously needs maintenance and upgrading it remains a popular Jamaican tourist spot. 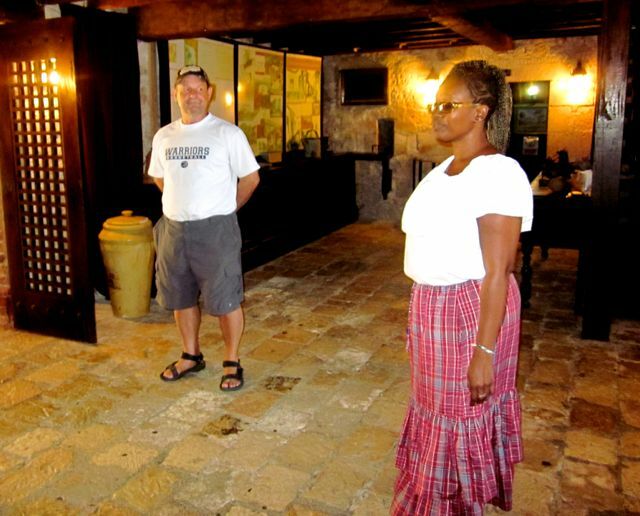 We were met at the front door by our guide Latoya. 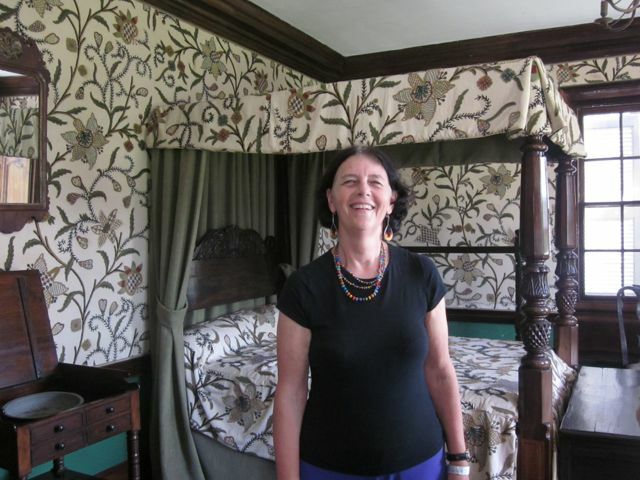 She told us the story of the beautiful Annie Palmer who lived in the house. 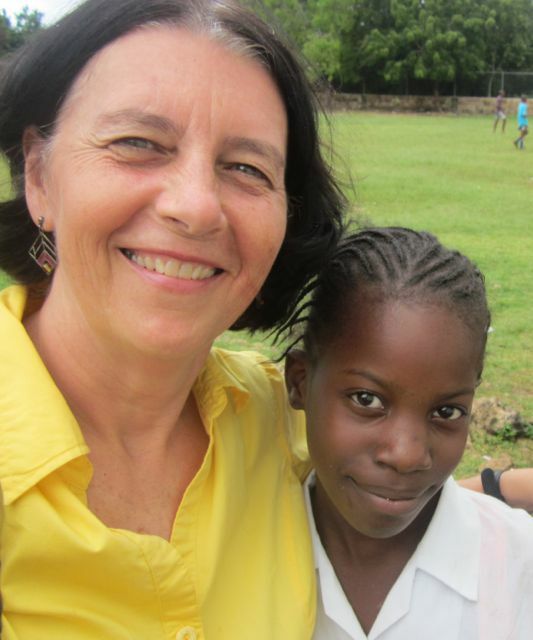 Annie moved to Haiti with her parents from Paris and when they died was raised by a nanny who taught her voodoo. She became the witch in the book title. 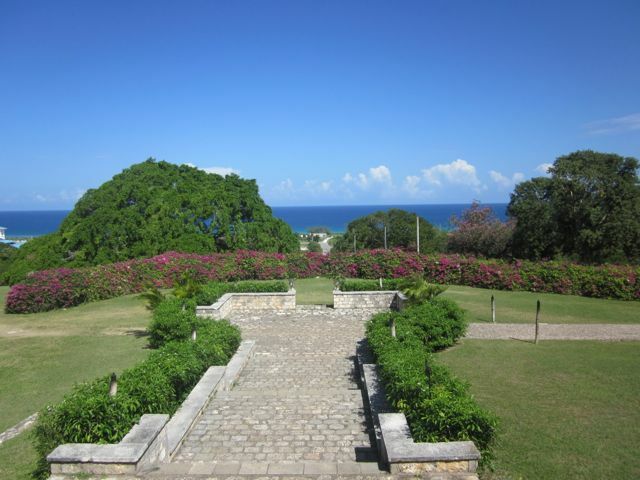 Annie left Haiti for Jamaica where she married John Hall. 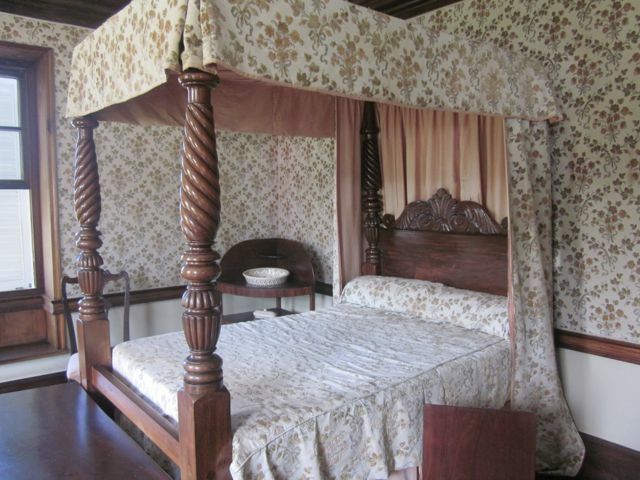 and then another bedroom where Annie killed her second husband by stabbing him and then pouring hot oil in his ear and……. 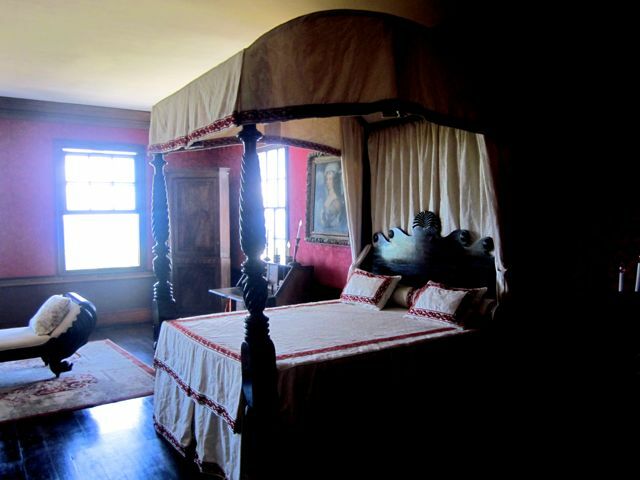 then another bedroom where she killed her third husband by strangling him. 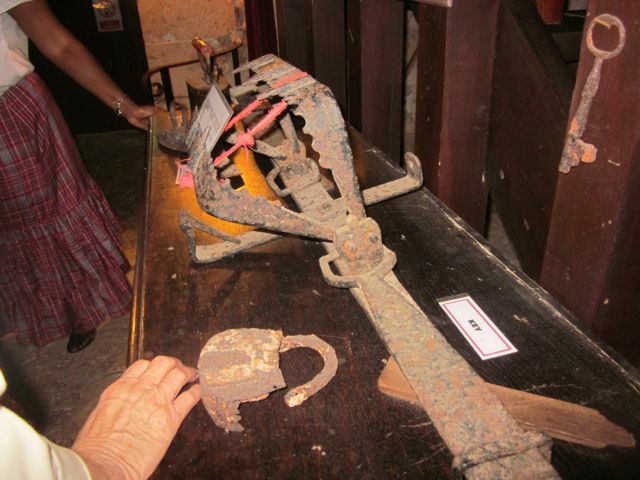 Latoya showed us the bear trap Annie used to capture runaway slaves before imprisoning them in the house’s dungeon. She was known for her cruelty towards her slaves and her harsh treatment of them, though she had many slaves as lovers. We also saw the trap door that led to the sea. Annie sent slaves there with her dead husband’s bodies and on their return she killed the slaves to keep the murders a secret. Her book-keeper and lover Robert Rutherford kept a journal where he recorded all of Annie’s misdeeds which is why we know about her story. When Millicent a beautiful young negress fell in love with Robert, Annie put a voodoo spell on Millicent in anger and she died. 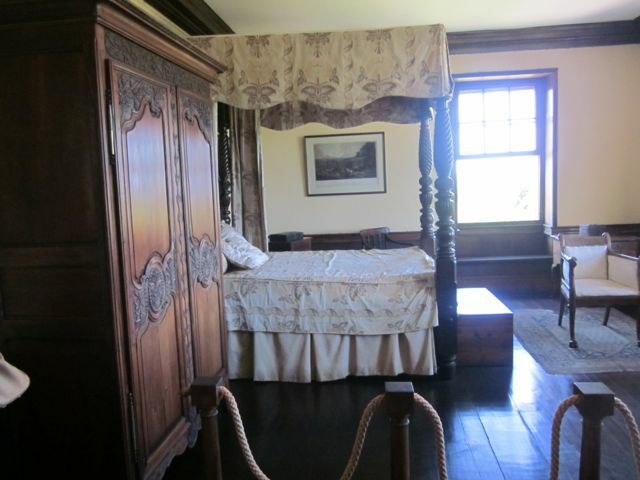 We also saw the bedroom where Annie was murdered. Millicent’s grandfather Takoo a former slave of Annie’s, as well as her former lover, got revenge for his granddaughter’s murder by strangling Annie. Dave on the front Rose Hall balcony looking out to sea. This is a balcony where a maid died in 1905. A family who had bought Rose Hall sent her ahead to clean the great house for them and it is believed Annie’s ghost pushed her to her death. We also saw Annie’s grave and while we stood around it Latoya our guide sang us the song Johnny Cash wrote and recorded about Annie called The Ballad of Annie Palmer. She even told us that the ghosts of Annie’s dead husbands and the maid who fell to her death are said to roam Rose Hall and there are tourists who claim to have seen them. 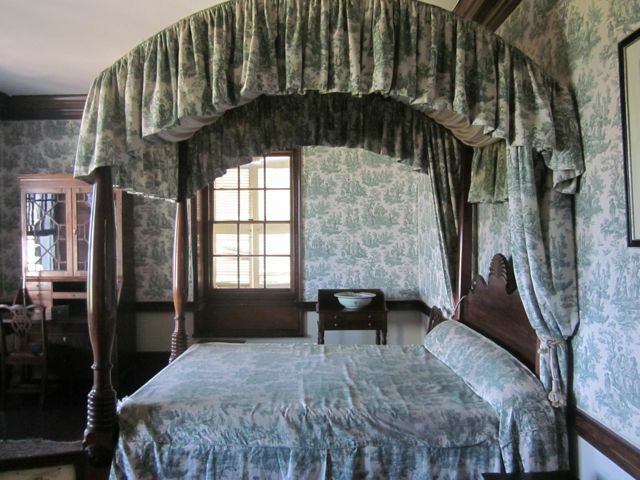 Guest bedroom where visitors to Rose Hall have claimed to see ghosts. At no time on our tour did the lovely Latoya tell us the whole story she’d spun was fictional and taken straight from the book The White Witch of Rose Hall. I only found this out later when I discovered the true story of Rose Hall online. 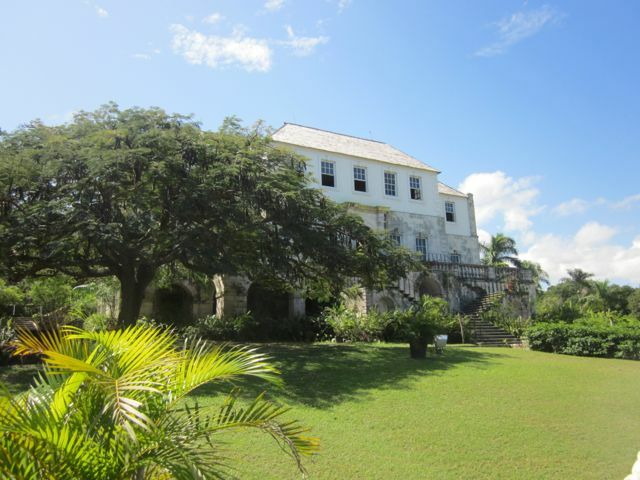 The house is named for Rosa Palmer an Irish woman who came to Jamaica and had three husbands- Henry Fanning who bought the land for Rose Hall, George Ash who built a great house on the land and John Palmer who merged the Rose Hall plantation with his neighboring one. Although Rosa was a widow three times none of her husbands died under mysterious circumstances. A portrait possibly of Annie Palmer at Rose Hall. Here eyes follow you wherever you are in the room. 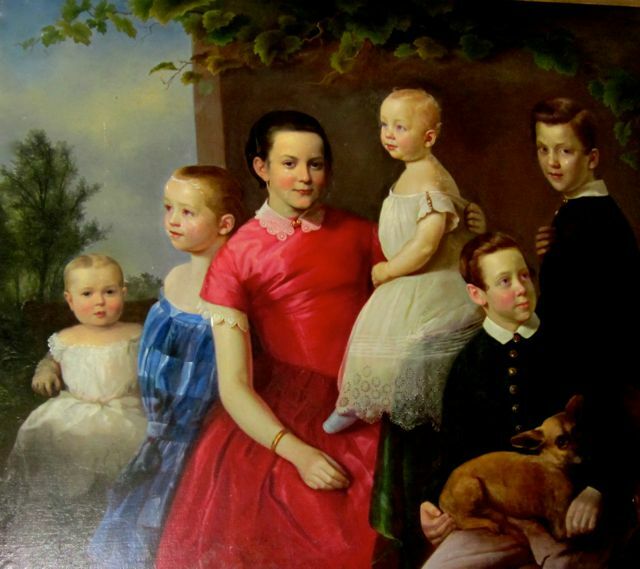 A great-nephew of John Palmer’s eventually inherited Rose Hall and married an Annie Patterson. They were happy together and model citizens. When John died in 1827 there was no suggestion of foul play. His widow Annie eventually had to sell Rose Hall to pay off her husband’s debts. That’s the real story. Not dramatic and scary but true. 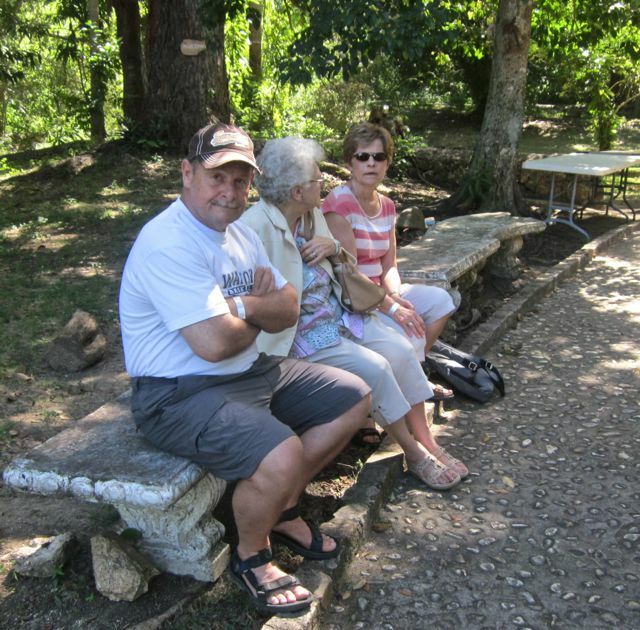 Dave with Mildred Beach and Ruth Janzen who were also on the tour with us. 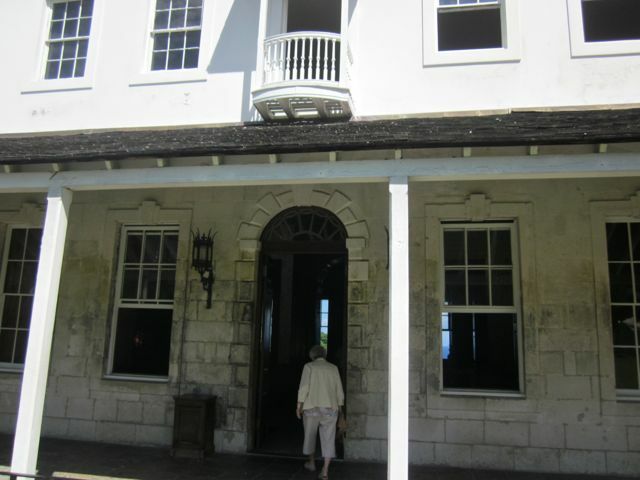 However not the kind of mundane tale that draws tourists to a place, so when author DeLisser set his racy novel in Rose Hall it probably seemed more lucrative to adopt that as the story of the plantation house. So if I know the whole story I heard at Rose Hall is pure fiction why couldn’t I sleep last night? The line between slave and master wasn’t black and white. The relationship was often intimate and certainly co-dependent. Yet at the same time each existed in a totally distinct reality that simply could not be understood by the other. That’s one of the things I realized after finishing The Long Song. 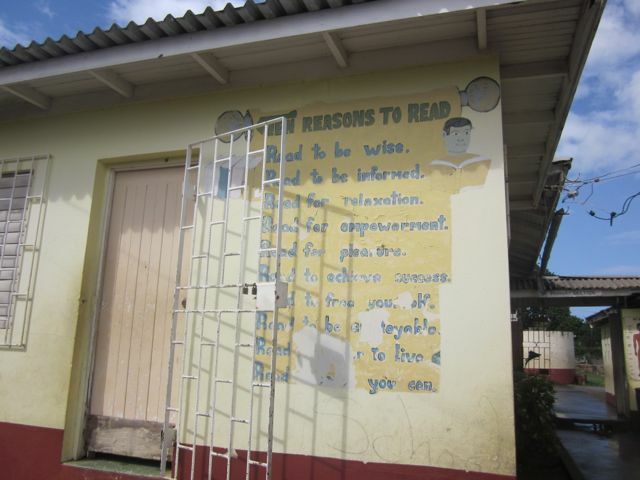 It’s the novel I’ve been reading here in Jamaica. Written by Andrea Levy and short listed for the 2010 Man Booker Prize it is set in the period just before and after the end of slavery. 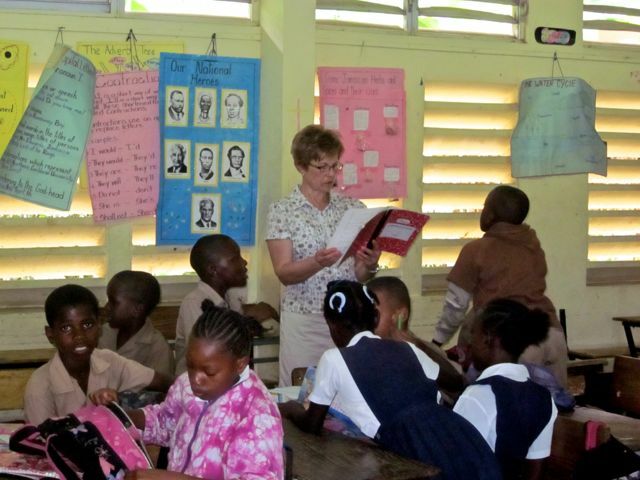 An elderly black woman named July is encouraged to write down her life story by her son who opens the first printing press in Kingston Jamaica. He promises he will print her book and distribute it. 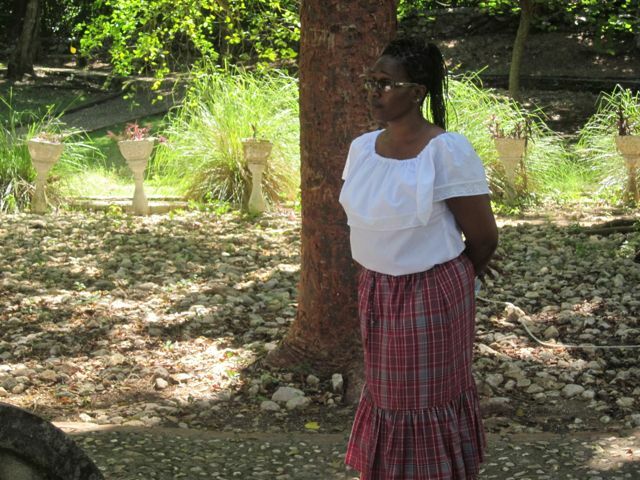 July was born a slave on a Jamaican sugar plantation but became literate after the master of her plantation committed suicide and July was needed to help with the day- to- day operations of the family business. To facilitate this her mistress teaches July the rudiments of reading and writing and July is a quick learner. July is reunited with her son, daughter-in-law and granddaughters after they have spent decades apart. She wants to write a novel to share a romanticized version of her life story with her family. Her son however keeps pestering her to stick more closely to the truth and at his insistence she does. Much of The Long Song is difficult to read. July and her mother are raped by white men and July is separated from both of her babies. 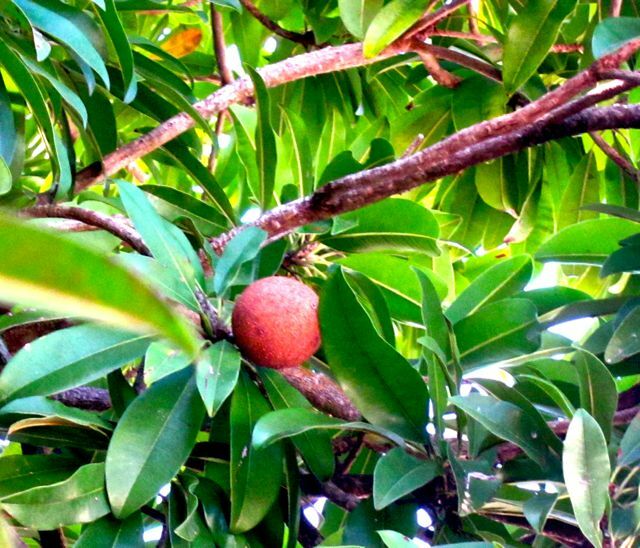 The brutal murder of rebellious slaves and their torture in plantation dungeons is described in a way that leaves little to the imagination. Having said that, July is a comedic narrator and her wry observations, sense of mischief and forthright opinions make the reader smile over and over again. I laughed out loud in a scene where July gets revenge on her master. She knows he is deathly afraid of cockroaches so she arranges for him to lift the lid on a serving dish at dinner that she has filled with hundreds of the creatures. I found July to be a convincing, complex and fallible heroine who stubbornly shoved her way into my heart. The book shows how the Jamaican Baptist church led the campaign to free the slaves but also illustrates how even the most fervent abolitionists sometimes found it hard to treat black people as true equals. 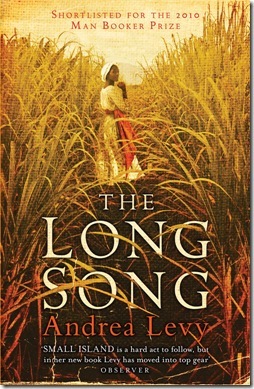 I read an enhanced version of The Long Song in I- Books which includes photographs and audio by the author describing the places she visited in Jamaica to do research for the book. 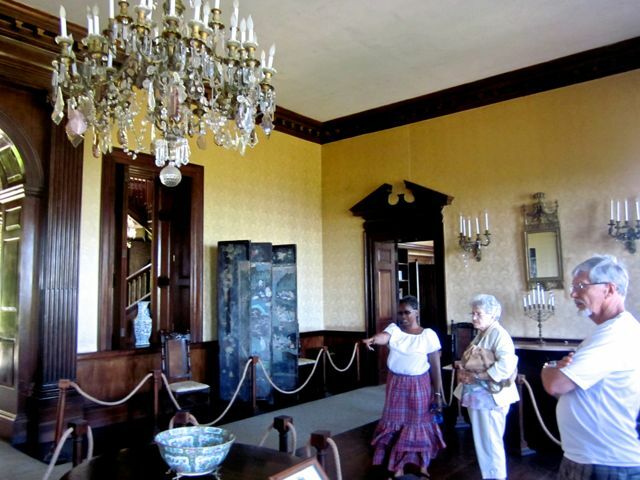 I want to visit a plantation house yet before we leave to explore what a possible setting for The Long Song might have looked like. 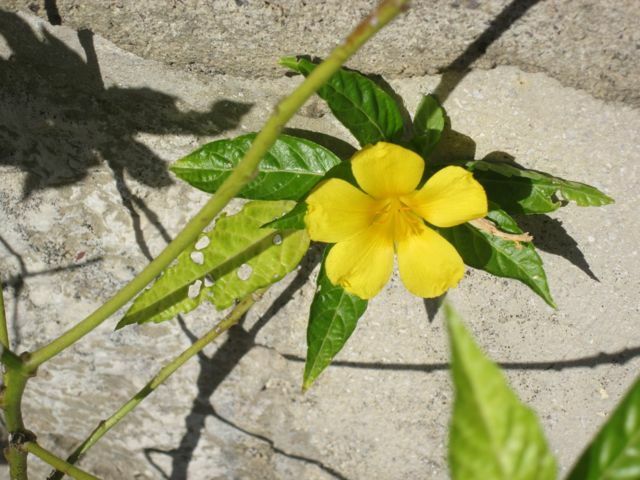 The years of slavery in Jamaica have left an indelible mark on the island that is still felt today and The Long Song gives the reader a greater understanding of that. 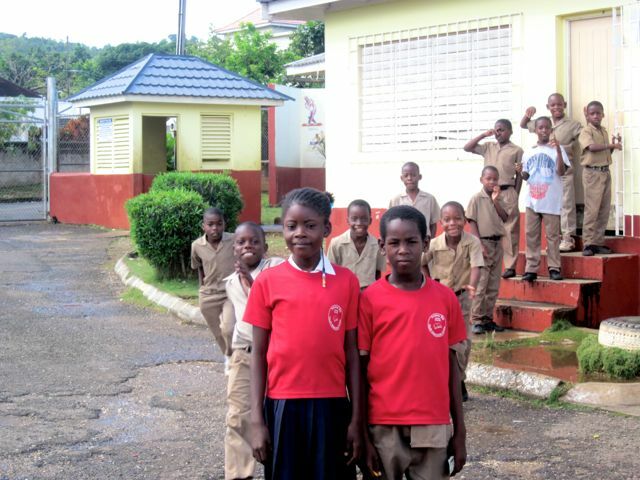 where the majority of children we tutor at the Runaway Bay Resource Centre are students. We saw piles of trash that hasn’t been picked up by civic employees in a long time and half-finished classrooms there is no money to complete. There were classes of children left unattended because their teacher was sick and there is no money to pay a substitute. 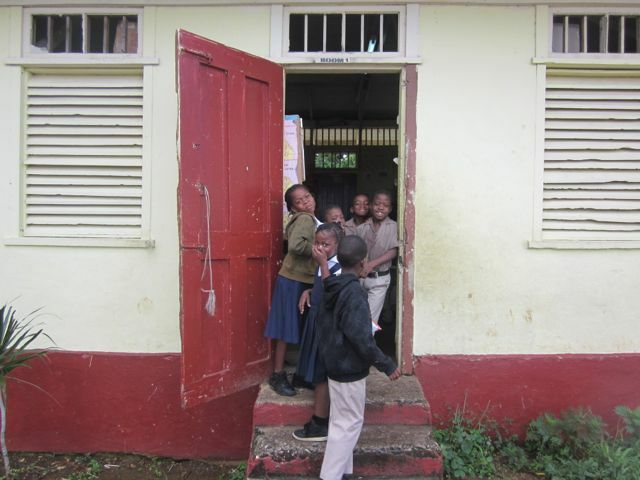 Children ran to take cover in doorways when it started to rain. The principal told us he will need to divide a class of thirty-five children up among the other teachers in his building when their teacher leaves next month to have a baby. There is no money to pay her replacement. The library and computer lab are closed because there is no money to replace lost and damaged books and no one in Runaway Bay knows how to fix the computers even if they had money to pay for repair. Our kids were so excited to see us at their school and many came up to visit and ask us to come and see their classrooms. JoseeAnn and Rojo two of the students I tutor in my group at the Resource Centre. 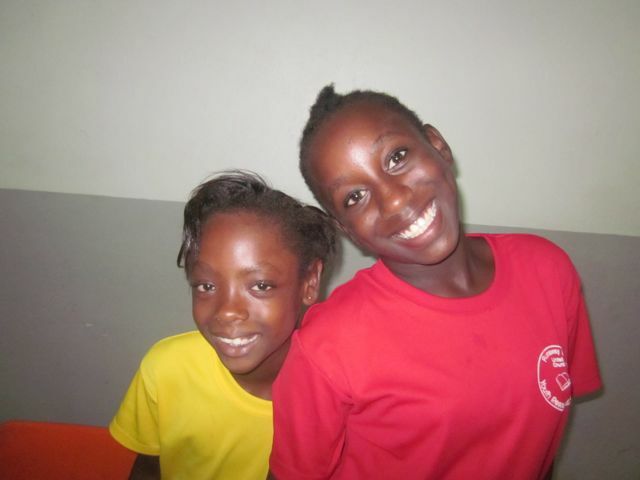 They are even wearing their Resource Centre T-shirts. Children seemed to be roaming around freely even though it wasn’t a break time. 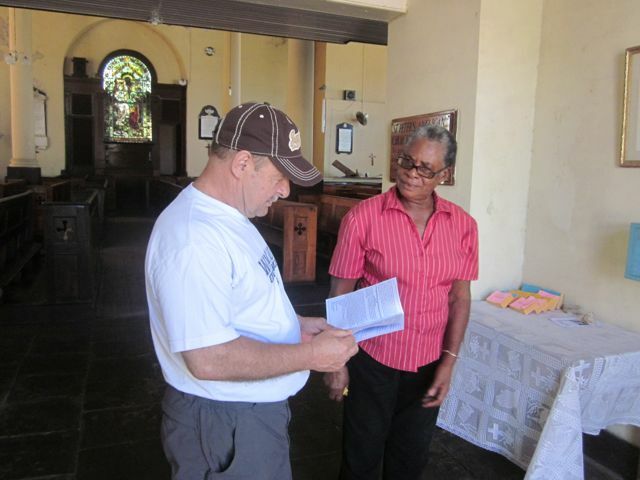 Ruth checks out the children’s notebooks. 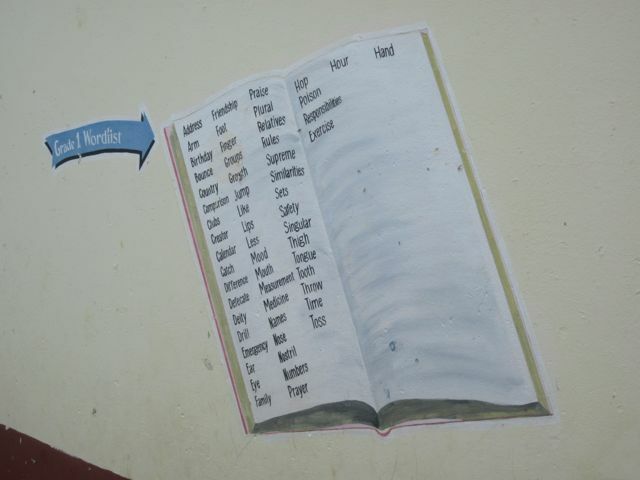 In some classrooms they were copying notes off the board. We looked at their notebooks and their handwriting was beautiful. I was surprised to see the full notebooks of advanced material that had been copied off the board by a number of children I tutor at the centre who I know can barely read. The teachers and students were very friendly. 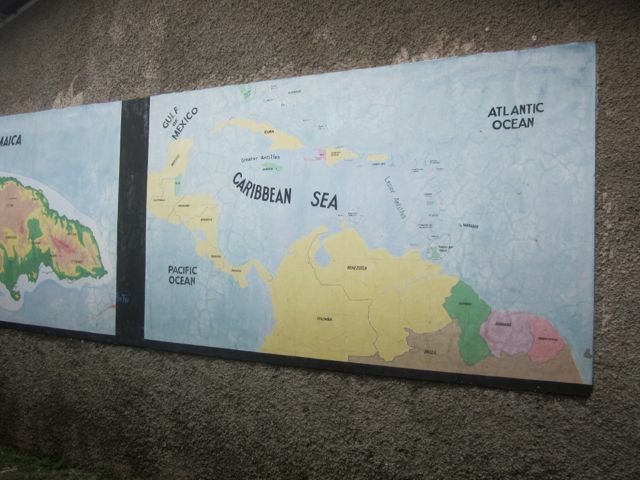 All the walls outside were painted with mottos and charts and maps. 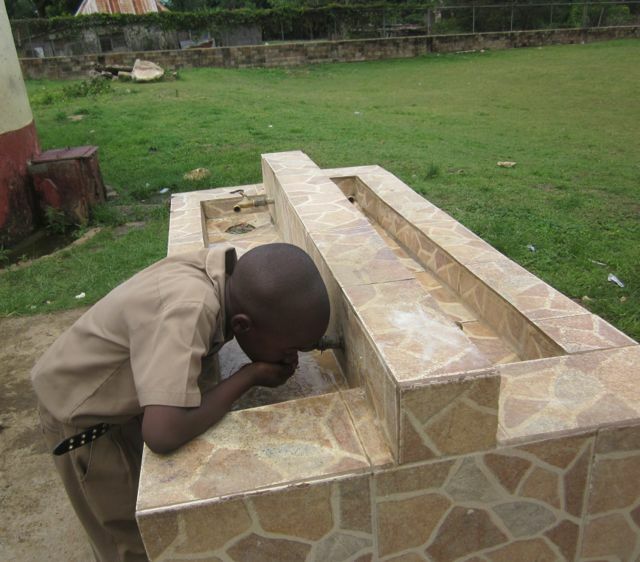 There was no playground equipment and the children washed their hands and drank from these outdoor spigots. 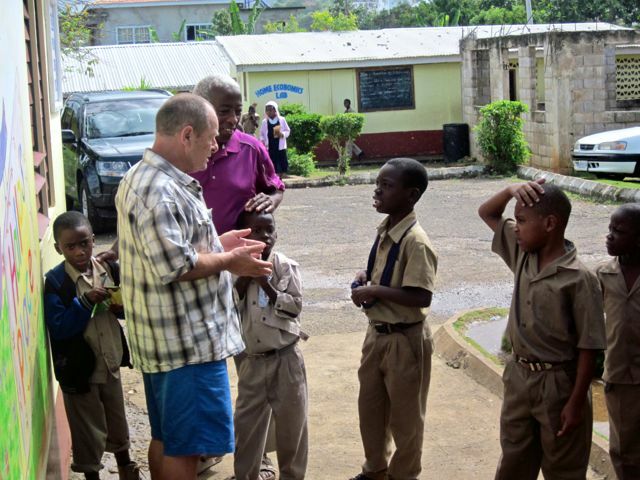 Spanish is the second language taught in Jamaican schools and Dave chatted with the Spanish teacher who comes in to work with each class once a week. 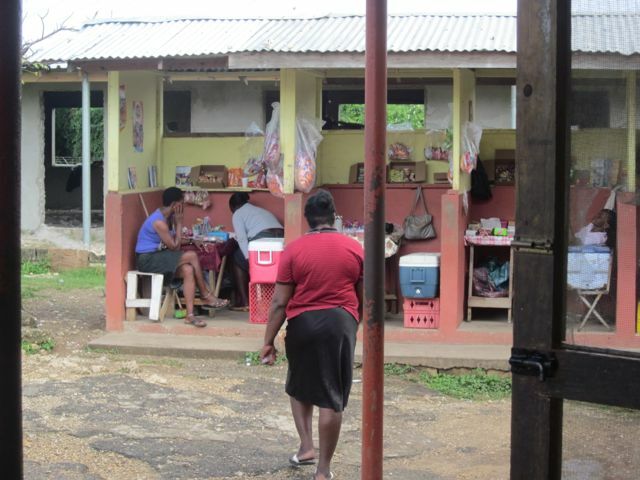 Vendors sell things like candy and chips and drink boxes to the children. They used to have their shops just outside the school yard on the street but the children were sneaking out to buy things from them and it wasn’t safe for the kids on the busy street so the vendors were invited onto the school grounds. 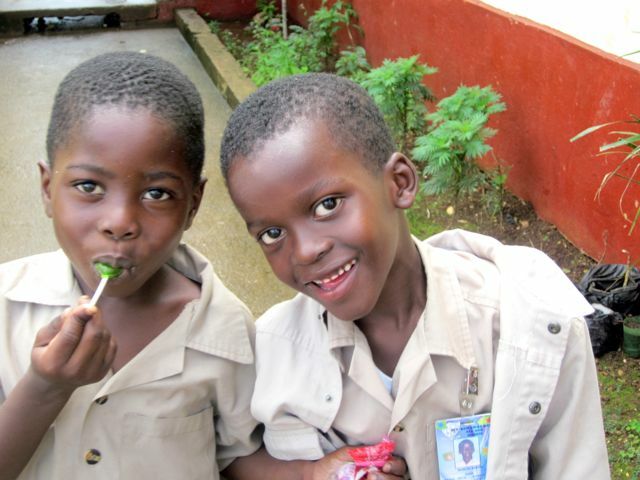 The children seemed free to go and buy candy from these vendors whenever they wanted. 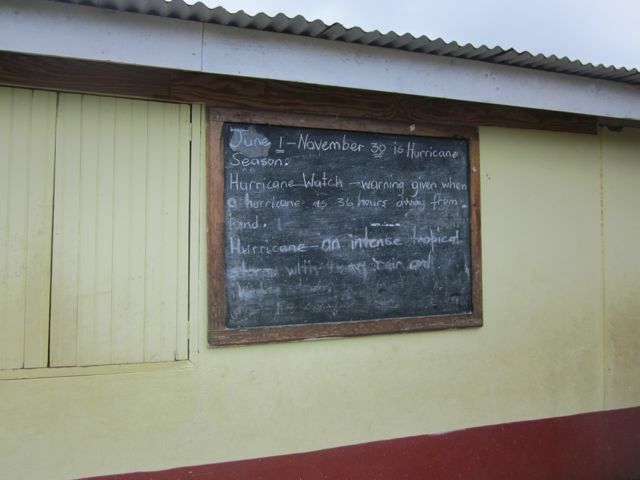 It’s hurricane season in Jamaica and this partially erased outdoor chalkboard gave the children and teachers instructions about what to do in the event of a hurricane. 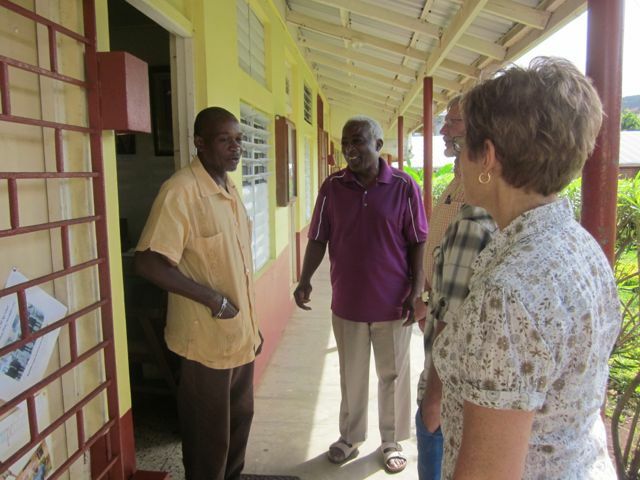 I admired the work many teachers had done to try to make their classrooms look bright and attractive. 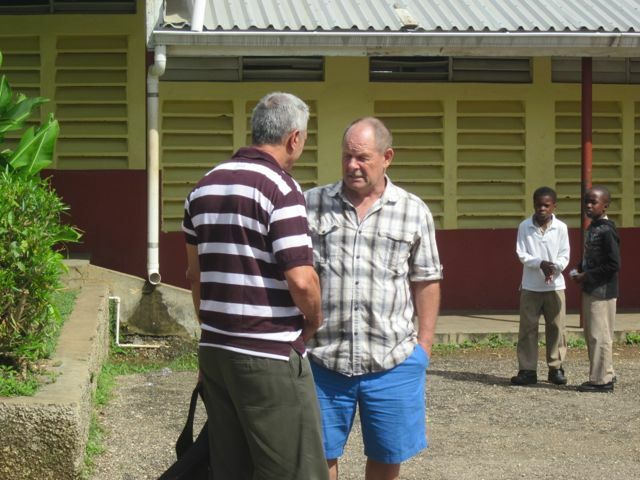 Our host Tony Beach is obviously appreciated at the school because he has helped them out in the past with donations. 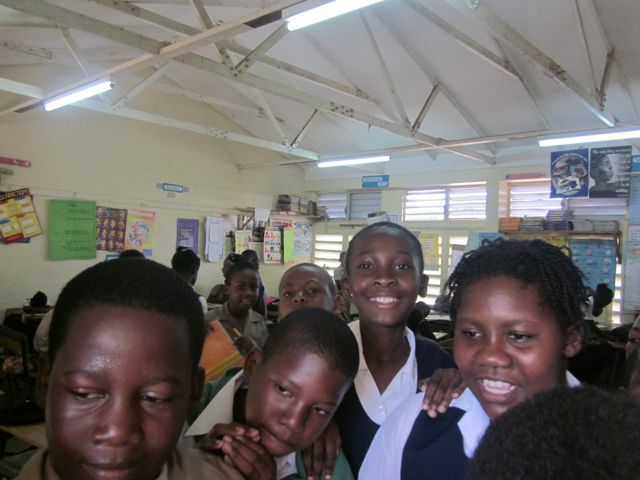 It was good for us to visit the children we work with at the Resource Centre at their public school. 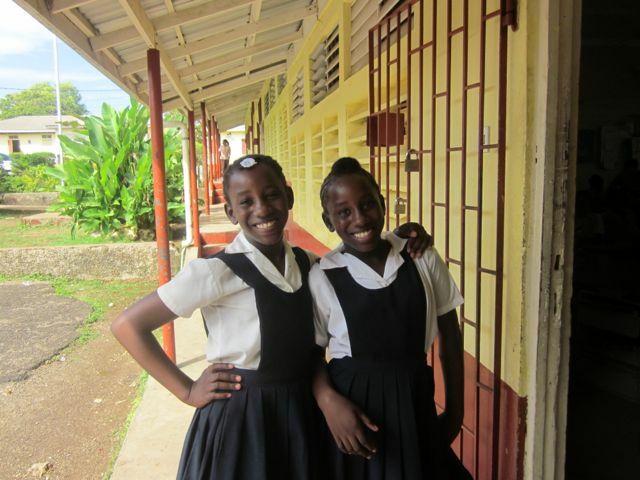 It gave us a much better understanding of the kind of education they’ve been receiving. 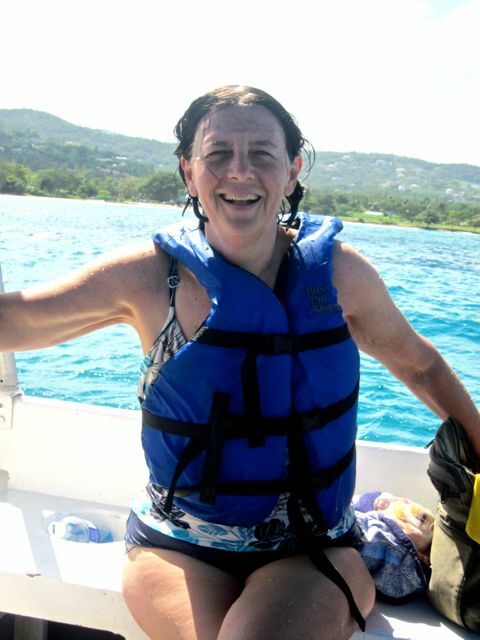 Other posts about children in Jamaica…..
A Snorkeling Trip That Was A Little Too Exciting! I popped up out of the water and a skier zoomed by just a few feet from my head! On Monday Dave and I were snorkeling on a reef here in Runaway Bay, Jamaica. 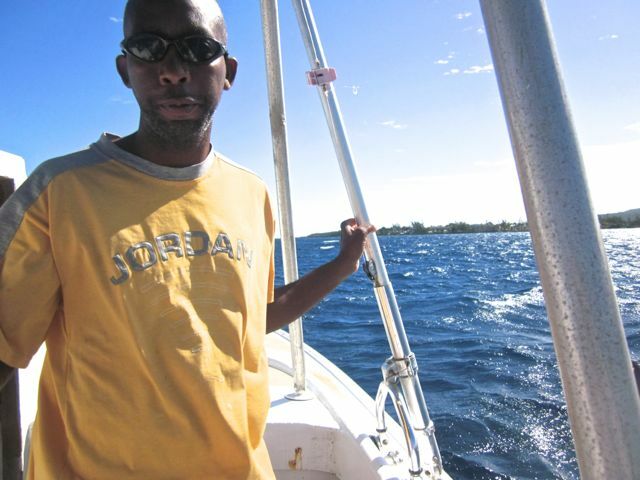 We’d headed out at around 9:30 with our boat driver named Breeder. He told us he’d earned that name because at 38 he had fathered twelve children and there was a set of twins on the way who would bring the total up to fourteen. We’d already spent a long time in the water checking out all the different kinds of coral and fish. 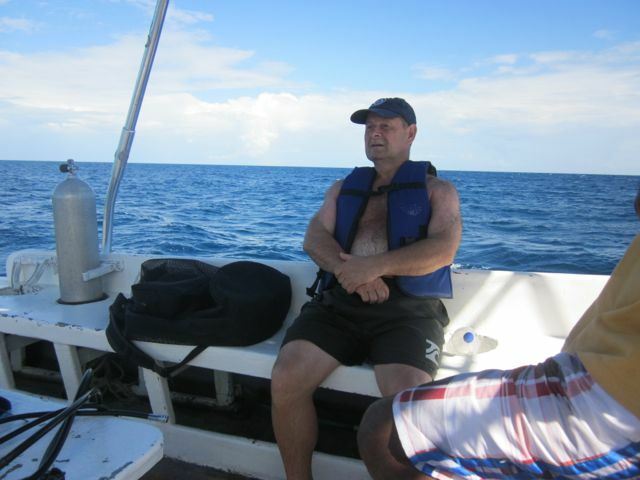 Dave decided he was ready to take a rest in the boat but I wanted to swim just a little longer. I’d gone quite far along the reef when I figured I should check where our boat was. I popped my head out of the waves only to be surprised by a water skier zipping right past me just a little too close for comfort. With my head under the water I hadn’t even heard the ski boat pass a few seconds before. As you can see I was perfectly fine. 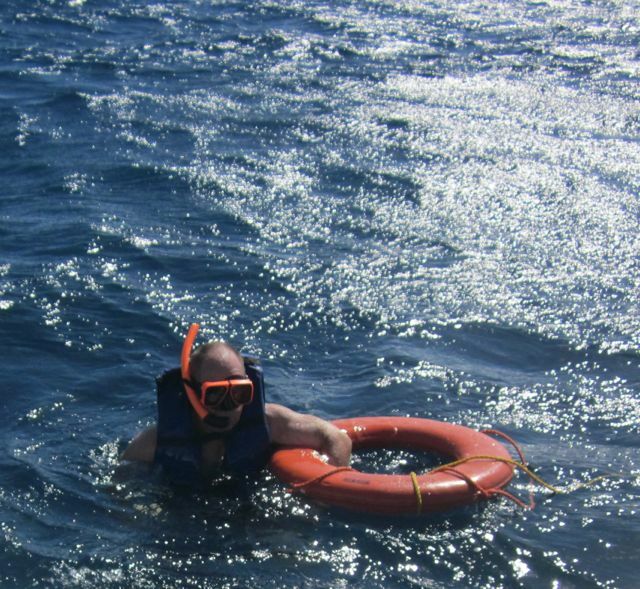 It was a lovely day to be snorkeling in the Caribbean despite my close shave with the water skier. Dave and I have gone snorkeling in lots of places- Hawaii, The Perhentian Islands, Boracay in the Philippines, Fiji and Thailand, but I think this trip just might be the most memorable. I’m glad I lived to blog about it. Other posts you might like……..